In this year’s budget the Saskatchewan Government announced a budget increase for the Heart and Stroke Foundation, to boost the FAST public awareness campaign. An additional $50,000 has been allocated specifically for the campaign, which raises awareness to the signs of a stroke. Since 2014 the FAST campaign has increase public recognition of stroke signs across the country. 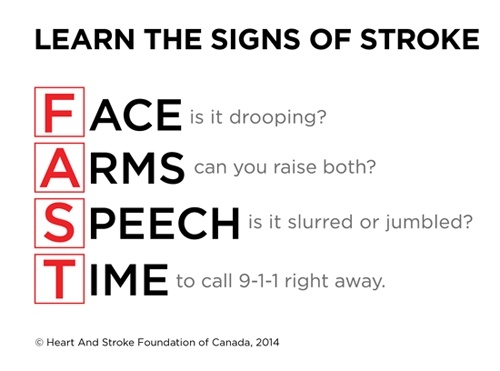 Calling 911 triggers a stroke alert province wide, which allows health care workers time to prepare to treat a patient experiencing symptoms of a stroke. The province reminds that a stroke is a medical emergency and people experiencing a stroke should never drive themselves to the hospital. Patients who arrive by ambulance experience faster treatment, which is critical when damage to the brain is happening.